UNITED NATIONS, Jan 11 2014 (IPS) - As the death toll rises from South Sudan’s spiraling political and ethnic conflict, the ability of the U.N. to enforce its peacekeeping mandate in the country is coming under increased scrutiny. On Thursday, U.N. under-secretary general for peacekeeping Hervé Ladsous told reporters the toll well exceeded 1,000 and reiterated that “the situation in terms of violations of human rights remains terribly critical.” The next day, the International Crisis Group released its own estimates that put the figure at up to 10,000. Yet since the deaths of two Indian peacekeepers during a Dec. 19 attack by Nuer militia on an UNMISS base in Jonglei State, the U.N. has engaged militarily neither the loose coalition of rebel forces led by former vice-president Riek Machar nor government SPLA troops fighting for President Salva Kiir. 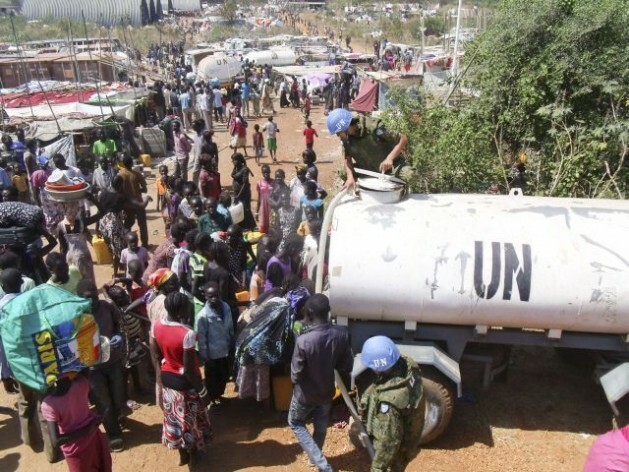 Vastly outnumbered by combatants, peacekeepers have been directed to protect UNMISS compounds where NGOs and the U.N.’s humanitarian agency, OCHA, have struggled to provide for upwards of 60,000 displaced South Sudanese who have sought shelter. “We cannot protect those people from being overrun while at the same time doing patrolling in an area the size of France,” said Kieran Dwyer, chief of public affairs at the U.N.’s Department of Peacekeeping Operations (DPKO). As fighting raged and the government appeared to retake the northern city of Bentiu Friday, Mongolian peacekeepers there remained near the city’s compound, where 9,000 residents had taken refuge. “It’s not our job to stand in the way of the anti-government forces fighting the pro-government forces,” Dwyer told IPS. Dwyer says UNMISS utilises local channels to inform combatants of the location of civilians and threatens them with accountability should they attack, but he admits peacekeepers themselves are fearful of being overwhelmed and killed and even of reprisal attacks within UNMISS camps if they were to engage one side or the other in a firefight. That state of affairs means little stands in the way of potential human rights violators, says Cameron Hudson, director of policy at the U.S. Holocaust Memorial Museum and former director for African Affairs at the National Security Council. Fighting began on Dec. 15 when Nuer and Dinka factions of the SPLA skirmished in the capital. President Kiir, an ethnic Dinka, immediately ordered the arrest of 11 high-profile opposition leaders and accused Machar, a Nuer, of plotting a coup, a charge Macher has denied. Despite international scepticism of Kiir’s account, Machar fled Juba and took command of rebels. The rebellion has displaced 400,000 people and pushed unknown numbers into the bush where they remain unreachable by humanitarian agencies and peacekeepers. The fate of those who fled their homes but didn’t make it to U.N. compounds lingers as a glaring question that neither the U.N. nor its critics appear capable of answering. Who Are the Rebels? And What Do They Want? For purposes of negotiations in Addis Ababa, Riek Machar represents the myriad groups in open rebellion against the South Sudanese State. But many of the militias and warlords who have seized land in the past month have but loose ties to the Nuer leader. There is a history in South Sudan of brokering ceasefires with smaller rebel groups by promising their commanders positions in government - a process that incentivises taking up arms. While Machar’s aims remain uncertain, groups he claims to direct could have minor goals in mind. Machar’s communication channels with these groups are vague and just as they could lay down their arms before Machar’s ex-SPLA regiments, they could continue fighting after a peace agreement should the accord not meet their own ambitions. The fighting has roots in a political battle that’s been brewing since Independence in 2011 and became tenser after Machar was sacked by Kiir in July of 2013. Opposition to Kiir’s increasingly authoritarian moves cut across ethnic lines, drawing the widow and son of SPLA founder John Garang – a Dinka – to Machar’s side, at least politically. Graft and corruption in the government and the country’s oil sector - exports account for 98 percent of state revenue - has been rampant since independence. Civil society leaders decry a culture of impunity among dishonest politicians. In one of the world’s poorest countries, having a place in any government is viewed as a ticket to riches. A ceasefire isn’t likely to address endemic roadblocks that the international community is loath to find solutions to. The violence comes as the U.N. unveils “Rights Up Front,” its new genocide prevention initiative – an attempt to address failures to avoid civilian deaths in past conflicts in places like Bosnia, Rwanda and Sri Lanka. Though it remains unclear how many civilians have perished in South Sudan, U.N. High Commissioner for Human Rights Navi Pillay in December reported mass graves had been found in Juba and Bentiu and cited “extrajudicial killings” and “the targeting of individuals on the basis of their ethnicity.” Observers believe more will be uncovered. But in South Sudan, UNMISS has been tentative. Still, in a Christmas Eve letter to the U.N. secretary general, Crisis Group President and CEO Louise Arbour wrote that the U.N. needed to do more to ensure the safety of civilians. “We feel that UNMISS, using its existing forces until additional troops arrive, should take a number of immediate, specific steps to prioritise protection of civilians, above all other mandated tasks,” said Arbour. From its beginning in 2011, UNMISS was mandated to protect with force “civilians under imminent threat of physical violence.” But despite signs of political instability in the SPLM governing coalition and an uprising earlier in 2013 in Jonglei state, the mission remained unequipped to prevent or intervene in violence on the scale seen in the past month. But others have said those investments meant the U.N., Johnson, and NGOs on the ground were more hesitant to criticise the government and highlight warning signs. Alex de Waal, executive director of the World Peace Foundation, says UNMISS was unprepared from the start. After South Sudan declared independence in 2011, peacekeepers that had already been in the country to enforce the 2006 comprehensive peace agreement between the north and south were shifted into the new mission. But Dwyer says part of the problem is some observers’ inaccurate expectations of the mission. The rationing of intervention isn’t a new strategy for U.N. missions. Though DPKO oversees the second-largest deployed army in the world, peacekeepers are spread thin among 15 missions and further divided among bases within countries. Last month, the Security Council voted to increase troop levels in South Sudan from 7,000 to 12,500, but a lengthy approval process has slowed their deployment. Ladsous, who previously told reporters the 5,500 new troops would arrive by the middle of January, now says they may not all be in the country until March. Meanwhile, as the conflict threatens to morph into a wider civil or regional war, information on deaths and human rights violations has become increasingly obscured by the fog of war. Adding to the dilemma facing peacekeepers is the presence of Ugandan troops fighting for the government. Ugandan President Yuweri Museveni is a strong ally of Kiir, but Uganda is also one of the countries mediating at U.N.-endorsed negotiations taking place in Addis Ababa. Observers say the talks in Ethiopia are unlikely to achieve a ceasefire until one side has gained a significant military advantage. All of this only makes a show of force more important, says Hudson. “The leaders of South Sudan, on both sides, bear responsibility for this conflict and for ending the fighting,” he said.